The possibilities are endless for your everyday cooking. Create the perfect feast, or baked treat for one. 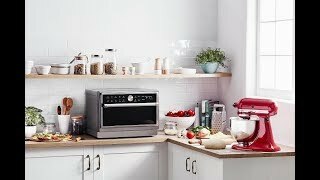 With a generous 33L capacity, the KitchenAid Bakers Microwave Oven makes your favourite meals quickly and easily from roast lamb, vegetable lasagna, pies, pizza and chips to the most delicate of cakes and desserts. Making it easier from making to baking with KitchenAid. Cook quickly and confidently with a countertop microwave that eliminates guesswork. Enjoy the control of sensor-driven and pre-programmed cooking cycles and precise timed defrosting. Optimises cooking time and performance according to the ingredients in the microwave. The Crisp & Bake technology provides one-touch results for crisp and bake functions. With pre-programmed recipes for Bake Assist, Chef Menu and Crisp Fry, make the cooking process even easier. The unique Crisp Pan, 3D microwave system and grill tube work together to reach high temperatures for baking and frying. Heat comes from above and below to ensure even crisp. Defrost and crisp frozen bread back to freshly baked. Revolutionary technology detects moisture variations in food during cooking and readjusts the time to always deliver perfect results in just one touch. Bake with powerful convection for even cooking results that are comparable to a traditional oven. Microwave is rated 5.0 out of 5 by 2. 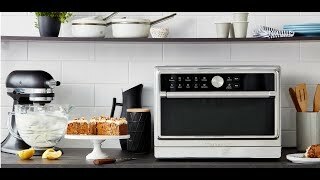 Rated 5 out of 5 by Dutchdi from BEST MICROWAVE EVER I Got the Bake Assist Microwave Oven as an Anniversary Present from my Husband and Son and I am in Love with it. I have only had it for just over a week and its amazing what it can do and all the features it has I have so far made the Meatloaf and the Roast Chicken in the microwave and it turned out fantastic better than I though it would and I am still learning all the features on it but so far so good. I couldn't wait to get it and it was well worth the wait. It sits on my bench in the kitchen along side my Kitchen Aid Mixer. Thank you Kitchen Aid for Bringing out this beautiful Microwave Oven I am looking forward to getting many years use out of this little beauty. I Cant wait to show it off to all my friends and to show them what it can do. So Thank You Once Again. Rated 5 out of 5 by De4567 from Lovely microwave/oven. So happy with this microwave, so easy to use. Have used it to heat up food and to bake cakes. Can't fault it. So simple to use and easier to clean than a normal oven. Have recommended this to few family members, however, due to its size it's challenging if you have a smaller kitchen counter. Be good idea if it came in a slightly smaller size too.